Here's a beer that just screams "That's so Kansas City!" and that's in a good way by the way. I'm currently on an out-of-state kick with sampling beers and when I spied a single bottle of Boulevard Brewing Company's Unfiltered Wheat Beer I grabbed it up and wanted to review it. This is a year-round offering from Boulevard that weighs in around 4.4% ABV, so it would definitely make for a sessionable offering. Boulevard Brewing describes this beer as "a lively, refreshing ale with a natural citrusy flavor and distinctive cloudy appearance. This easy drinking American-style wheat beer has become our most popular offering, and the best-selling craft beer in the Midwest". And now apparently Colorado is getting a taste of this brew as well. Back in 2008, this beer won a Gold Medal in the Session Beer category in Denver. It seems that the Colorado crowd loved it and kept it around for the last several years. I'm a bit surprised that a brewery these days would give it's beer a generic name. Unfiltered Wheat Beer says what it is and leaves it at that. Nuff said I suppose when its one of their best sellers. I've only had one other Boulevard beer before and wanted to get to know this Missouri brewery a bit better. On the neck of the beer was the "Best By" date that told me this brew was still considered good for another 7 weeks. Appearance: As expected, this Unfiltered Wheat Beer poured a moderately cloudy light yellow color and seemed to be decently carbonated after being conditioned in the bottle. Once in the glass, there rose a wonderful solid 2-finger white head that seemed to last a good long time. Even after the bubble subsided, there maintained a single white bubble layer that didn't go away. There was plenty of creamy lacing on the glass when swirled that gently slipped off the glass within a few seconds. This looked like a very well made wheat beer. At the bottom of the bottle was a bit of yeast that I included most of in the pour. I'm not afraid of a bit more flavor! Aroma: Here again was that distinguishable clove and banana aroma that I find in many wheat beers. I could pick up on the citrus notes as well, almost a bit tropical. The hop combo of Bravo, Palisade, Simcoe and Summit seemed to work well in the nose. The smell of this beer was very inviting. Taste: Nice and cold, this beer tasted very bready with a hint of tart fruit on the side. At least it felt sharp and slightly tart at first taste, but later on that mellowed and the light malts and bread-like flavors were dominant. The beer was lightly bittered to let the malts and wheat take center stage here. There was a bit of sweetness on the back end of the sip and made for a nice follow through and finish. Overall: I must say that I've grown to appreciate the standard wheat session brew and this beer fit the mold very well. I enjoyed this beer from start to finish. While I can't say that wheat beers are very outstanding, this beer was very satisfying just as it was. I would definitely seek this beer out again if asked which wheat beer would I want to have at a bar or restaurant. I would have no problem having a few of these in a single session. It's not too heavy and drinks easy. Nice job Boulevard. Disclosure: I paid full retail price for this beer as part of a build-your-own six pack at a local Colorado liquor store. - Boulevard Dark Truth Stout review. 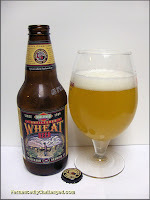 - Breckenridge Agave Wheat review. - Dry Dock Hefeweizen review.